The markets have had a very nice rally since mid July when Mario Draghi, ECB Head, gave a speech indicating that the ECB will do “whatever it takes” to keep the Euro together. This week has brought a modest pause to the advance. The question now becomes, “Is this a pause, or the beginning of the end to the rally?” Unfortunately, in today’s politically charged environment judgment can be clouded. And global events certainly add an additional interesting backdrop for today’s investors. The chart below is from http://www.chartoftheday.com. 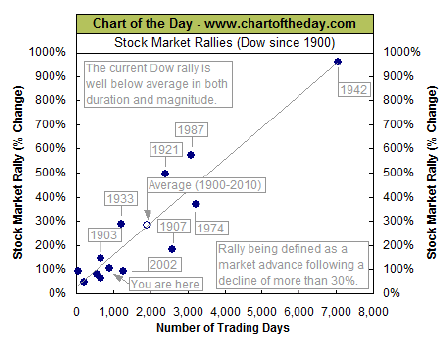 The chart plots all major market rallies of the last 111 years. Each blue dot represents the rally’s total return and the length of the rally. The “You Are Here” dot is in the bottom left corner. 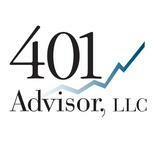 The question I am asked frequently is whether the market is “too high” since we are approaching all time highs. From the chart below, it is evident that, by historic market rally standards, this rally has just begun. Unfortunately, investing is never that clear cut. If you look just above the “You Are Here” dot, you’ll see the label for “2002”. The post “tech wreck” rally was slightly less in return and slightly longer in duration than where we are now. And as we all now know, the 2002 – 2007 rally ended most unhappily. Conclusion: If this is another “Bear Market Rally” i.e. Similar to the 2002 – 2007 rally, we are likely looking at an over extended market. But if this is truly the beginning of a new market cycle, then we are just at the beginning. Over the weekend I’ll work on a new post outlining our current strategy as we head into the years final quarter. Link to my weekly column. Charles H. Dow Award Winner 2008. The papers honored with this award have represented the richness and depth of technical analysis.